Fascinating. I dug in the code and think I found it. 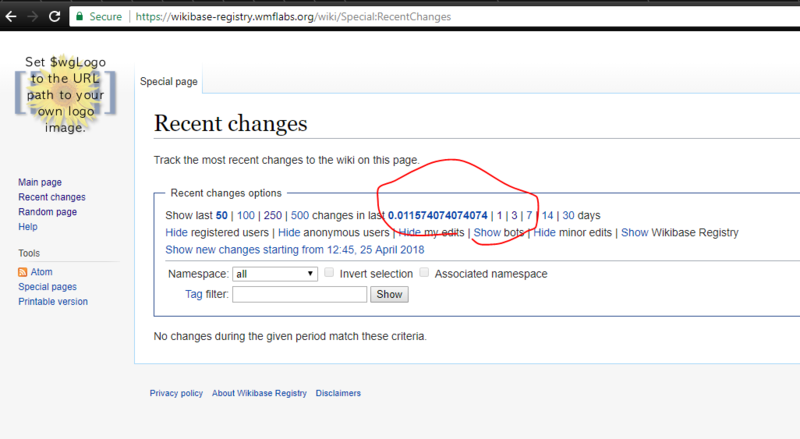 The line of code to blame is https://phabricator.wikimedia.org/source/mediawiki/browse/master/includes/specialpage/ChangesListSpecialPage.php;062d935971a96b788953448fc2b150056a41924e$1325. On this server, $wgRCMaxAge is set to 1000, which limits the days you can ask for to values between 0 and 1000 seconds. The default is 1 day, but this is truncated to 1000 seconds. This is added as a new value to the list of possible values. It would be possible to add a min( 1, … ) to the line of code I pointed to, and to remove values that are larger from the list. But to be honest I don't think it's worth it fiddling with this code. Set https://www.mediawiki.org/wiki/Manual:$wgRCLinkDays to [ 1 ]. I’ve temporarily commented the line, and now RecentChanges and Watchlist look normal. But that doesn’t solve the problem for all the other containers we created with this configuration. AfroThundr3007730 lowered the priority of this task from High to Lowest.